Situated in the hills just above the beautiful shingle beach of Agio Petros midway up Alonissos's east coast, Hisbiscus offers flexible living with a traditional island feel, a pool, and a splendid choice of panoramic terraces from which to gaze out to sea and soak up the gentle Greek atmosphere. Inside: accommodation at Hibiscus is spread across a main house and an independent, externally accessed studio. The front door of the main house takes one into the living room, whose high white-beamed ceilings, feature stone wall, comfy sofas, fireplace and French windows make for a light and welcoming atmosphere. To one side of the living area, heading past a guest bathroom, is the well-equipped country style kitchen, complete with small breakfast table and access to the main, shady al fresco dining area. A few steps lead from the living room up to the main house's sleeping quarters, which comprise a master double bedroom, a twin bedroom and a family bathroom with tub and shower attachment. Both bedrooms have French windows allowing direct access to the various terraces found around the villa. The independent studio is situated under the main house and accessed via steps either from the parking area or from the main terraces. It hosts an open-plan living and sleeping area, an en-suite shower room and a kitchenette. Surrounding the studio is a large covered terrace with outdoor dining area, perfect for a relaxed breakfast. Outside: due to its position on a hillside the outdoor areas at Hibiscus are set over a variety of terraces on different levels, each offering wonderful sea views. A spacious terrace wraps around three sides of the main house, accessed from the living area, the kitchen and the two bedrooms. Shaded areas alternate with sunkissed ones and there is plenty of room for dining, sitting and relaxing. To one side of the main house is a tree-shaded semi-circular terrace,home to a built-in barbecue and sink and the perfect spot for dinners. Above the house, accessed via a flight of steps, is the pool area, which offers a shady pergola and a raised sunbathing area for anyone working on their tan. More steps lead down from the main house's outdoor areas to the studio, which has its own lovely sea-view patio. Where the terraces end, the fragrant verdant countryside begins, this itself delimited by the sandy beach and transparent waters just below the house. The beach below the house is accessed via just over 60 steps and a short path and takes about 2 minutes. Being on a slope with several different levels, Hibiscus's grounds have quite a lot of steps and a few drops. Please ask us for more information if you feel this could be an important factor for anyone in your group. Due to Hibiscus's location on the island of Alonissos and the limited number of hydrofoil/ferry connections between Skiathos-Skopelos-Alonissos (which might occasionally delayed or cancelled due to bad weather), we recommend that you book your flights to arrive either the day before your stay at the villa or in the morning of your arrival day. Similarly, for departure, we recommend you book either a late flight or a flight on the day after leaving the villa. Hibiscus sits above a lovely sandy beach about half way up Alonissos's east coast. The seafront tavernas, amenities and harbour of Steni Vala are about 10 minutes' walk away, making it eminently possible to dine out without ever taking the car. 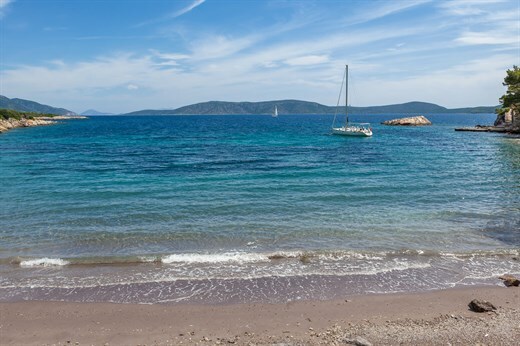 The island's main port, Patitiri, and the historic capital, Alonissos Town, are just a 20-minute drive away. "For those looking for a quintessentially Greek property look no further, Hibiscus is absolutely charming. One of my most memorable and relaxing holidays ever!" Hibiscus was charming and we loved the easy pace of life and walking to Steni Vala for breakfast or supper. I loved the feeling of being off the beaten track and how friendly the locals were. It felt quite unspoilt. We loved our time at Hibiscus. For those looking for a quintessentially Greek property look no further, Hibiscus is absolutely charming. One of my most memorable and relaxing holidays ever! A great hike can be down straight through the villa's grounds up to the old town of Chora, down to a wonderful beach and then along to the port at Patitiri. We had a wonderful time at Hibiscus. Being able to often be the only swimmers in the bay near the villa was wonderful and we were very pleasantly surprised by how clean the water is. We loved our holiday! The staff were lovely, they keep the beautiful garden, herb pots, flowers and the house really nicely, We will be booking again with you for next year. Hibiscus is a great villa. End of road. Very quiet and great views and lots of locations around the villa to enjoy the surroundings. We had a very relaxing holiday, just what we wanted and hoped to find. No disappointments. Hibiscus is a haven of peace and tranquillity. We were spoilt for choice with sea view terraces to while away the time and decide on which beach to visit next! Waking up and popping down to the beach below for a morning swim was a fantastic treat. The house is full of charm and character and we felt very much at home. It was all perfect and it was incredibly hard to leave!